Tiger Pie- Harry’s Cafe de Wheels, Sydney. Don’t ask me how I’ve managed to live in Sydney most of my life and yet I’ve never had a pie at iconic Harry’s Cafe de Wheels.After all, I’m a Sydney local and yet Colonel Sanders, Elton John, Jerry Lewis and other overseas celebs have somehow managed to not only find Harry’s and sample his Tiger Pie but have also had their photo taken and slapped onto the walls of the cart. 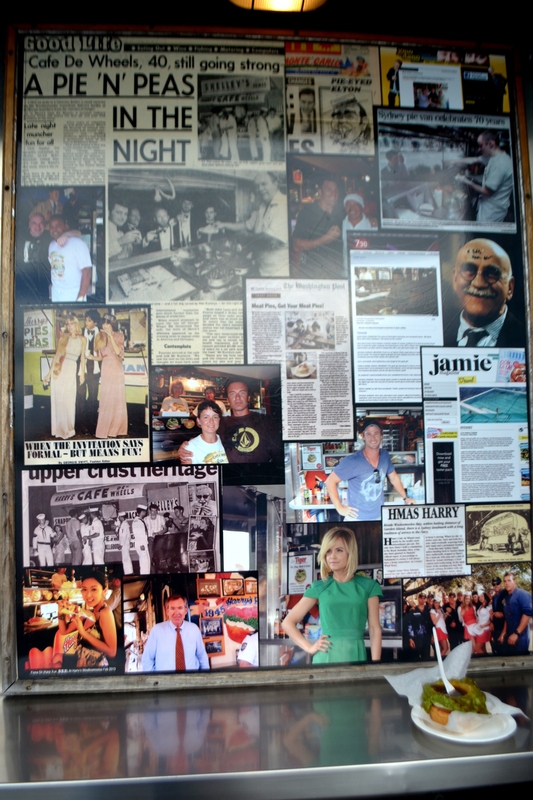 Yes, the walls of Harry’s cart read as one hell of a hall of fame…a veritable who’s who. 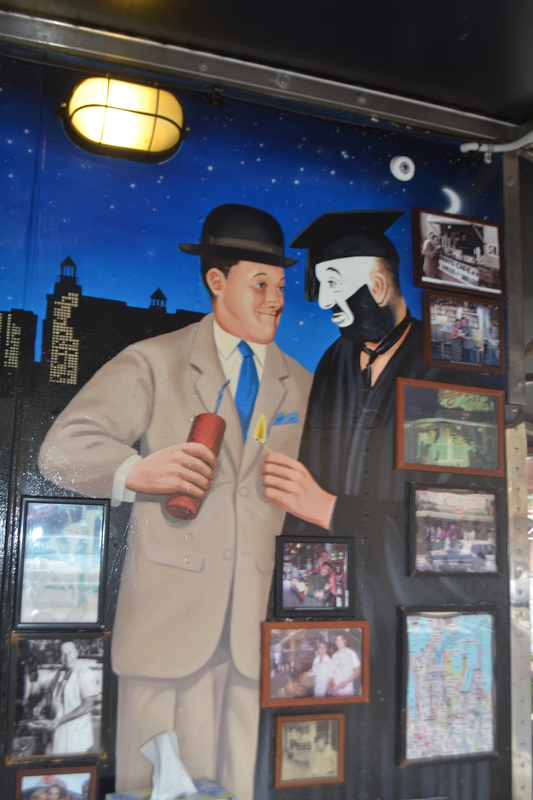 The Wall of Fame at Harry’s Cafe de Wheels. Yet, isn’t that way when you’ve lived in a place most of your life. You become complacent. Go elsewhere on your holidays and immerse yourself in the absolute experience and yet you only skim over the surface at home. On the other hand, Sydney is a huge city dissected by it’s glamorous Harbour and has its pockets. You’d be spreading yourself pretty thin to really get to know all of our fabulous city and it’s environs. We ended up at Harry’s Cafe de Wheels after visiting the Garden Island Naval Base to tour HMAS Toowoomba, which was opened up as a charity fundraiser for Kids in Need , which includes Muscular Dysdtrophy NSW, which also supports my neuromuscular disease, dermatomyositis. Eating my Tiger Pie. Give me a few minutes and then you’re going to hear me roar! As our taste buds wrapped around the iconic Tiger Pie, which is basically adding mashed potato and mushy peas to a variety of basic pies…chicken, beef, cheese and bacon. 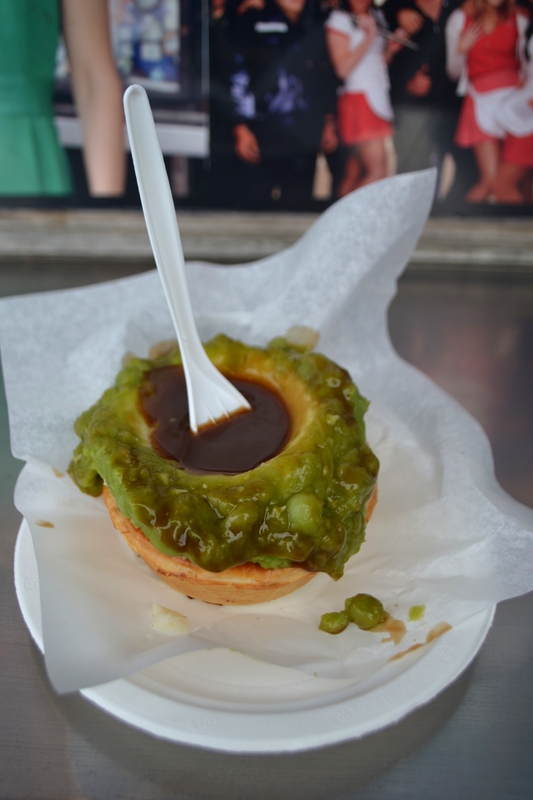 The pies are also served up with a pond of tasty gravy on top and a fork. We also ordered some hot chips which had to be among the very best hot chips we’ve ever eaten…crunchy on the outside and soft on the inside. Sign for Harry’s inimitabl Tiger Pie. 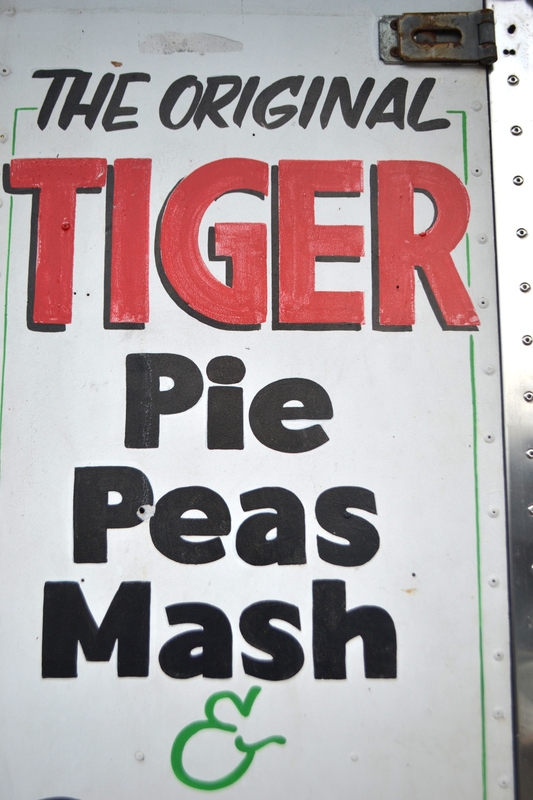 Although “Tiger” was a nickname the original Harry picked up while he was serving in the Middle East during WWII, it truly did feel like trying to devour a tiger of a pie as we wrestled with all that potato, peas and gravy armed only with a humble plastic fork and hoping and praying that the lot wouldn’t end up splat on ourr laps. The Tiger eaters amopng us, therefore, decided to sit at the tables provided on the side of the cart rather than joining Mister sitting by the water. 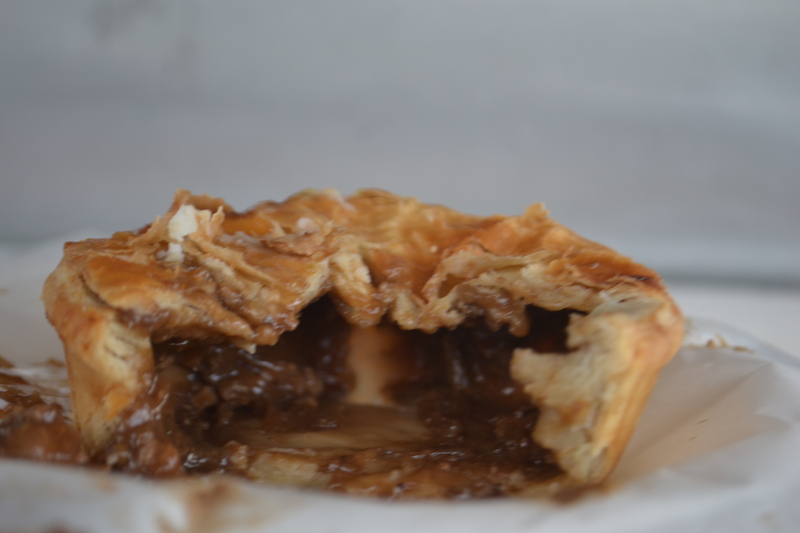 I really loved my pie but found it very salty…possibly due to the gravy. Miss showed no respect for her pie eating the topping and the middle, leaving behind the pastry. Mister ate that in a flash. However, the pie is only part of the whole Harry’s experience. There’s also the history which is etched into its walls. 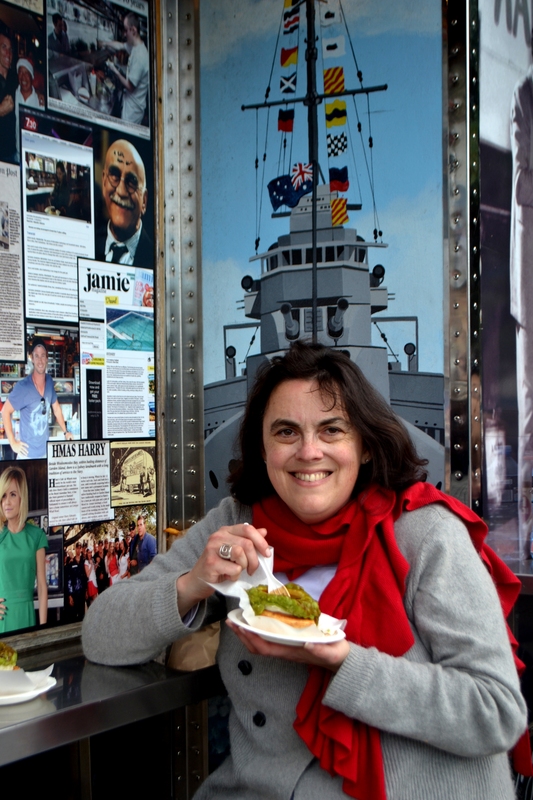 The Original Harry’s Cafe de Wheels now parked permanently at Sydney’s Powerhouse Museum. In 1938 Harry ‘Tiger’ Edwards first opened a food cart at the corner of Macleay St and Cowper Wharf Road in Woolloomooloo. When war broke out he joined the army, serving with the 2/2nd Machine Gun Battalion in the Middle East. He was wounded and discharged in November 1942 suffering from severe asthma. Edwards was said to be ‘quite a character’, a gambler and a man who liked to be his own boss. He drove a taxi and a fruit truck before rigging up an old army ambulance as a mobile canteen which he operated at rugby league matches and other sporting events. In 1945 he swapped the ambulance for a makeshift caravan – the one in the Museum’s collection — and parked it outside the Garden Island Naval Dockyard. When the police told Edwards to move his van as it was disrupting traffic, a thief mysteriously stole the wheels. This was in 1945 and for years, Harry’s Cafe de Wheels had no wheels at all. The Maritime Services Board and Defence officials who controlled the Dockyard negotiated a permanent spot for Harry’s Cafe outside the naval base. ‘Besides, in 1945, people did not like to see bureaucrats pushing around wounded veterans who were trying to make an honest quid for themselves’ (Jefferson Penberthy, ‘Sydney Morning Herald’, 11 July 1981). Despite harrassment by the Council, State and Commonwealth Police, Harry’s nocturnal eatery remained, although it was shifted up and down Cowper Wharf Road a number of times. 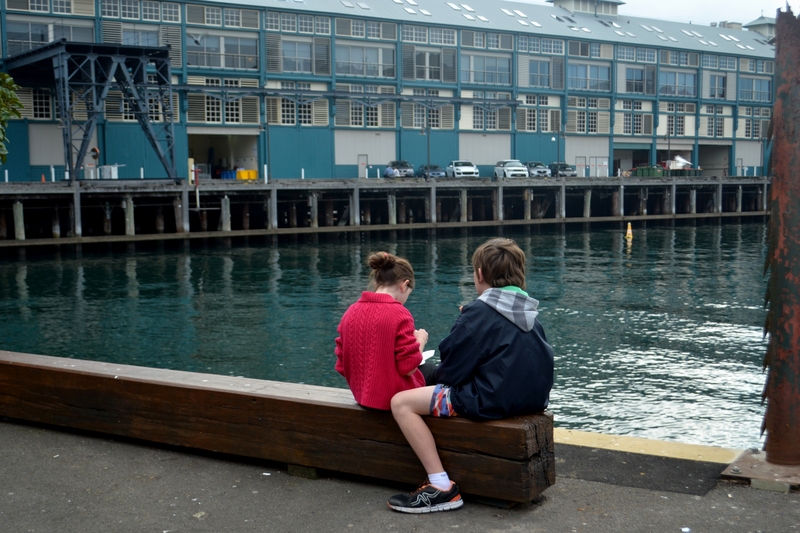 The Kids Seated behind Harry’s and looking at Cowper Bay Wharf, Wooloomooloo. So after such an impressive cast of patrons, in 2015 we turned up. 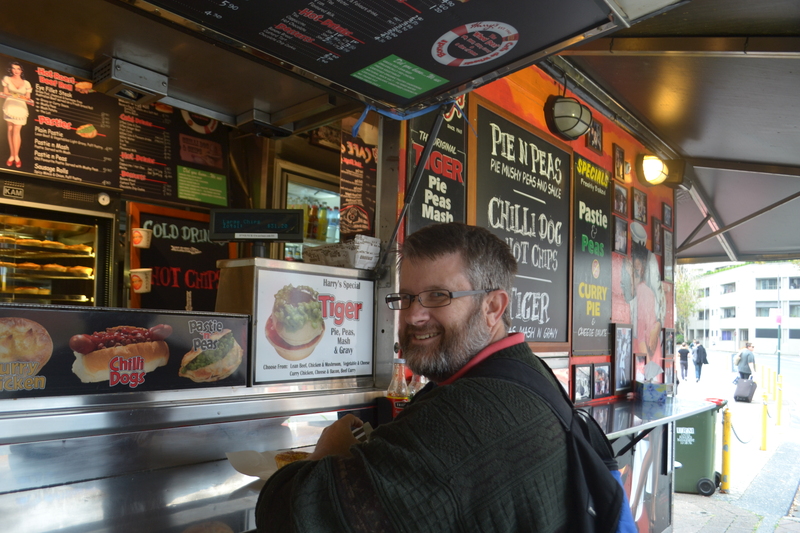 Have you ever been to Harry’s Cafe de Wheels? Do you have any thoughts about getting to know your own backyard? This entry was posted in Sydney Postcards, Travel and tagged Australia, family, food, Harry's Cafe de Wheels, history, kids, meat pie, parenting, photography, Sydney, Tiger Pie, travel, Wooloomooloo on May 31, 2015 by Rowena. I have heard many times of people expressing their desire to do something radical to inspire others, to become a role model to follow. Usually those people try to follow a life that does not correspond to our modern life style anymore. This entry was posted in Uncategorized on May 30, 2015 by Rowena. 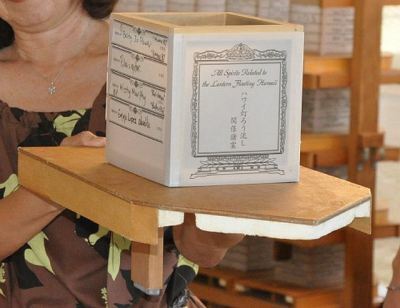 Since 1999, an esoteric Buddhist denomination called Shinnyo-en has sponsored a “Lantern Floating” ceremony on Memorial Day to create a moment of reflection and collective compassion and remember those who have passed. The name “Shinnyo-en” means “a borderless garden of the unchanging and real nature of things,” and its principal doctrine encourages everyone to develop the ability to act with unwavering loving kindness and compassion. That’s a pretty good thing, methinks. The original Lantern Floating was a modest affair, held in a lagoon out near Honolulu Airport but grew in popularity and since 2002 it has been held annually at Ala Moana Beach Park, the major regional park adjacent to Waikiki. This entry was posted in Uncategorized on May 29, 2015 by Rowena. Yesterday, I was pretty stoked when I put a white board up in my son’s room. This wasn’t a new idea. Indeed, their whiteboards have been stacked up on top of each other in our kitchen no doubt sprouting cobwebs after I’d appropriated them for my writing. Yes, like so many best intentions, the whiteboards had been derailed and I guess you could say that the track crew has been leaning on their shovels for more then an extended lunch break! Anyway, there was just one unexpected hitch. What on earth was I going to put on it? What with this empty white board screaming out at me, my mind went blank in what was probably a rare case of writer’s block. Of course, I could’ve just left it up to him. After all, it is HIS room, HIS whitebard and ultimately “HIS life”. But, no man is an island…especially a child who is still growing up and needing, at the very least, a bit of steering if not a total re-direction. If your kids play Minecraft of similar no further explanation is required!! Fed up raving at the kids like a rabid dog, I was tempted to simply repeat the list of actions which has been laminated and parked on the kitchen table to ticked off. However, I also wondered whether I should write some encouraging messages on it. That it should be a happy board, not a grumpy one. I ev en wondered whether writing “I love you” would probably have a much better impact than “make your bed, tidy your room. 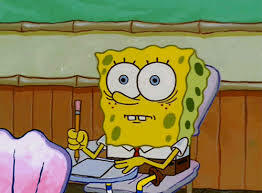 Have you done your homework? Stop hitting your sister!” Don’t you think?!! Besides, if he feels loved, he might just do all of the above because he feels valued, appreciated and wants to be part of the team. Yeah! Yeah! Yeah! I’m sceptical too! Yet, as much as you might be loved, what matters is that you feel loved and too often that gets lost in the translation. So, a few reminders, even if they seem a little cheesy, wouldn’t go astray. At this point, I started to wish Mr Squiggle was still around and he could come and help me out. He’d know exactly what to do. As for me, I’m still feeling overwhelmed because, like so many of us, I am so caught up with getting it right.Indeed, too right and dare I mention the p word… perfectionistic! Mr Squiggle…I still love the little guy. He was incredible! If you are not Australian or of a certain age, you won’t have heard of Mr Squiggle. So, here’s a quick introduction. 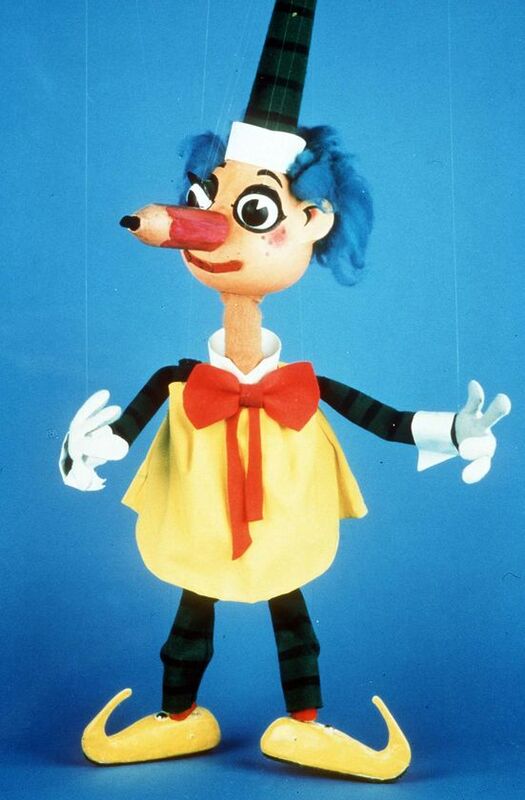 Mr Squiggle was a marionette with a pencil for a nose, who visited his friends from his home at 93 Crater Crescent on the Moon, flying in his pet rocket (named Rocket). Mr Squiggle was a cheery, scatter-brained character who would often be distracted and would occasionally go for “space-walks”, and his assistant would need to calm him down to get him to focus on the task of drawing. Mr. Squiggle was created by Norman Hetherington, and the character first appeared on the Children’s TV Club on ABC TV but was spun off into his own programme which first aired on 1 July 1959. Children wrote in with their “squiggles” and Mr. Squiggle would turn them into recognisable drawings by connecting lines with his pencil nose. More often than not, the picture would be drawn upside down and then Mr. Squiggle would gleefully declare: “Upside down! Upside down!” – asking his assistant to turn the picture the right way up and reveal the completed drawing. The last episode went to air just over 40 years after the first, on 9 July 1999. So, inspired by Mr Squiggle, I could draw Mister a picture. I could even draw a picture of him. He’d love that and indeed, he’d probably like to draw on there himself. Have some fun! I could also say I love you. I am also going to write important reminders on there. Not just pick up your putrid socks and undies and put them in the basket but “Scouts Tonight”. If all of this fails, I might just have to resort to employing Mr Squiggle’s enigmatic co-star, Bill blackboard. 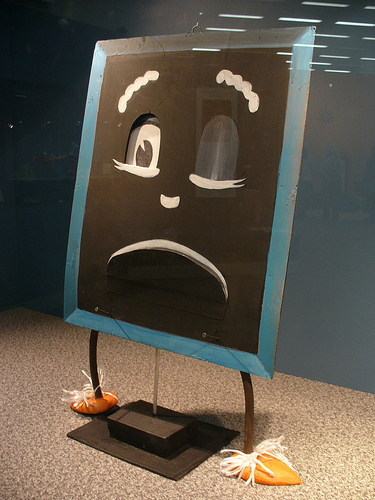 Bill, who was a rather grumpy, cantankerous character who contrasted well with Mr Squiggle’s friendly, dithering creativity, could well have been the inspiration behind Grumpy Cat and certainly could use a motivational coach.This grumpy blackboard’s catch phrase was: “Hurry Up”. The rather cantankerous Bill Blackboard. I hate to admit it but Bill Blackboard could well be impersonating me on a weekday morning!! 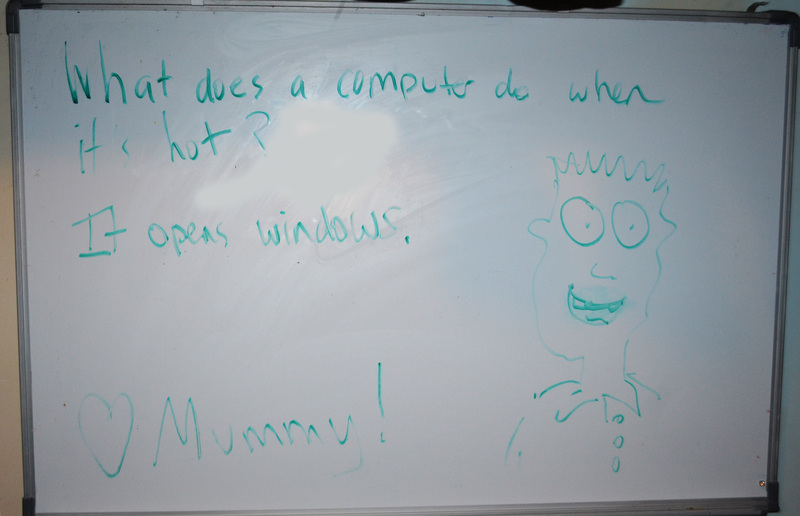 The finished Whiteboard: a joke, a drawing and love from Mummy! 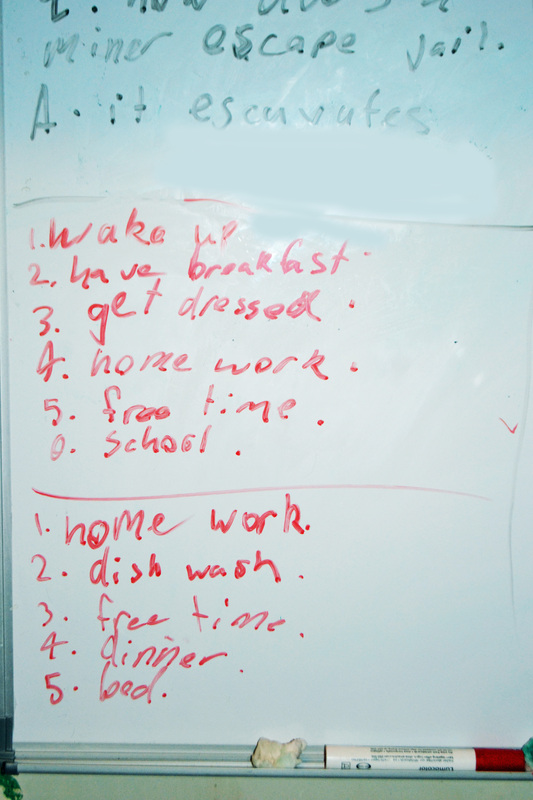 I should have waited for Miss 9 to get home from school. She did a great job with the whiteboard. She even added the date.She left my drawing alone. All this goes to show that I can take a mole hill and turn it into a mountain and truly stress myself out in the process. It also shows that I need to consult the kids more in the decision-making process and that they can make some veryt useful contributions. After all, they’re growing up! By the way, in a previous post I wrote about moving on some of the toys the kids have outgrown to make way for growth. Although the car bed is still parked in the lounge room, the dolls’ house left today. I am not only proud of Miss for being able to let it go but she also used her knowledge of knots from cub scouts to tie the dolls’ house on my friend’s roof racks. Well done! Very impressed! 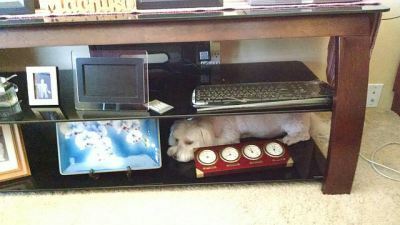 This entry was posted in Parenting and tagged anxiety, children, communication, discipline, family, kids, love, mom, motivation, Mr Squiggle, mum, Mummy, parenting, relationships on May 29, 2015 by Rowena. Remember this not-too long ago post about our hope to share great adventures from our visit to hospice and the hospital? Well, I’m here to tell you that “great’ might have been a bit of a stretch and over zealous on my part. Truth be told, I am more flummoxed than ever. Apparently getting even for the bath thing was on the agenda though I didn’t know it at the time. This entry was posted in Uncategorized on May 28, 2015 by Rowena. For the A-Z challenge, I am posting writing and editing tips to help you improve and enhance your writing. 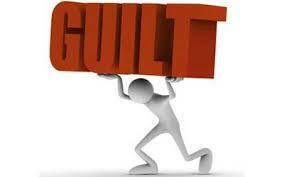 If you spend any amount of time writing, whether for pleasure or for work, then the chances are that you probably feel guilty. This entry was posted in Uncategorized on May 27, 2015 by Rowena. #WritingANovel: Preparation for Plotters and Pantsters. PS Tell sick kids and injured kids that you’re on a schedule!! One sick and driving the other one back and forth between school and Xray and scans on her Achilles heel. This is probably just the beginning of trouble as she’s a dancer. So you’re ready to write your novel? You’ve got an idea burning away at the back of your mind that you can’t get rid of. Characters keep popping up, talking to you, urging you to write their story. But the notebook’s blank, the computer screen‘s white. You’re hesitating over that first line. How do you get prepared? Well, that rather depends on whether you’re a plotter or a pantster!